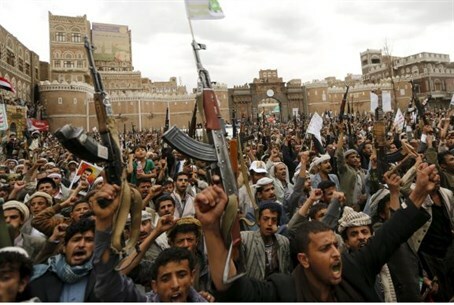 Yemen's ambassador to the UN asks for ground forces to save the country from Houthi rebels. Yemen's ambassador to the United Nations on Wednesday asked the international community to quickly intervene with ground forces to save the country from Houthi rebels who have been targeted by Saudi-led airstrikes for weeks, reports The Associated Press (AP). In a letter sent to the president of the UN Security Council and obtained by AP, the ambassador, Khaled Alyemany, also called on human rights organizations to document what he called the Houthis' "barbaric violations against a defenseless population." The call for the use of ground forces comes as the international community instead calls for an immediate ceasefire, or at least humanitarian pauses, to deliver aid to civilians trapped in the fighting. Alyemany did not immediately comment, and it was not clear what kind of land forces his country has in mind. The Saudi-led airstrikes began on March 26, two days after Yemen sent the council a similar letter asking it to authorize a military intervention to oust the Houthis and asked members of the six-nation Gulf Cooperation Council for immediate help. The Saudi-led coalition is seeking to restore the authority of President Abdrabbuh Mansour Hadi, who was forced to flee Yemen in late March when the Houthis began marching on Aden, before capturing central parts of the city. It is believed that Iran is planning to use the Houthi rebels to take over Yemen and seize the key strategic port of Aden, which controls the entrance to the Red Sea and ultimately to the Israeli resort city of Eilat. The spokeswoman for the current council president, Lithuanian Ambassador Raimonda Murmokaite, confirmed that the ambassador had received the new letter but said the council so far was not scheduled to discuss it on Thursday, according to AP. The letter came as the Houthi rebels and their allies on Wednesday consolidated their hold in another part of the southern port city of Aden, where the UN said violence was getting increasingly intense. Several districts in Aden governorate were completely cut off, the deputy spokesman for the secretary-general, Farhan Haq, told reporters earlier Wednesday. Alyemany's letter lists a few examples of "latest barbaric events in Aden." The letter says more than 50 civilians, including women and children, were killed by Houthi strikes on their boats as they tried to flee Tawahi district. The letter claims that the Houthis are "targeting anything that moves" in Aden, killing humanitarian workers, using tanks and heavy artillery on families and preventing medical teams from reaching injured people.